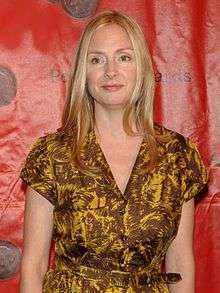 Hope Davis (born March 23, 1964) is an American actress. She has starred in films such as About Schmidt (2002) and American Splendor (2003). For her role in the original Broadway production of God of Carnage in 2009, she received a Tony Award nomination for Best Actress in a Play. She has also received two Emmy Award nominations, for her 2009 television roles in the series In Treatment and in the film The Special Relationship. Davis, second of three children, was born in Englewood, New Jersey, the daughter of Joan, a librarian, and William Davis, an engineer. Davis has described her mother as a "great storyteller" who would take Davis and her siblings to museums or to "something cultural" every Sunday after church. Davis was raised in Tenafly, New Jersey and graduated in 1982 from Tenafly High School. She was a childhood friend of Mira Sorvino, with whom she wrote and acted in backyard plays. Davis graduated from Vassar College with a degree in cognitive science. She is married to actor Jon Patrick Walker. They have two daughters, Georgia (born August 31, 2002) and Mae (born December 30, 2004). Davis made her debut as a dramatic actress in the 1990 film Flatliners, starring as William Baldwin's fiancée. She then appeared in the hit film Home Alone in a small role as a Parisian airport receptionist. Later, she starred in independent films such as The Daytrippers (1995) and Next Stop Wonderland (1998). These led her to roles in Hollywood films such as the thriller Arlington Road (1999), and About Schmidt (2002). In 2003, she starred opposite Paul Giamatti in the movie adaptation of the Harvey Pekar comic American Splendor as the comic book version of Pekar's real-life wife, Joyce Brabner. For this role, Davis won the New York Film Critics Circle award and was nominated for a Golden Globe for Best Actress in a Supporting Role. In 2009, she was cast as Hillary Clinton in the BBC / HBO film The Special Relationship, released in 2010. She has received a nomination for Emmy Award for Outstanding Lead Actress – Miniseries or a Movie for her performance as Clinton. Her major stage debut came after she starred in the Wisdom Bridge/Remains Theater co-production of David Mamet's play Speed-the-Plow for Joel Schumacher (her "Flatliners" director) with William Petersen in Chicago in 1992. Later, she had lead roles in the New York premiere of Rebecca Gilman's Spinning into Butter in 2000, and in the 2005 audio play Hope Leaves the Theater, written and directed by Charlie Kaufman. This was a segment of the sound-only production Theater of the New Ear, which debuted at St. Ann's Warehouse in Brooklyn, NY. The title actually refers to Davis's character "leaving the theater." She returned to the stage in 2009, appearing in Broadway's God of Carnage with Marcia Gay Harden, James Gandolfini and Jeff Daniels, a role that gained her a Tony Award nomination for Best Leading Actress in a Play. Davis co-starred as the bitter and self-deprecating Mia with Golden Globe winner Gabriel Byrne in the second season (2009) of HBO's In Treatment, a dramatic series that tracks the backstory and progress of five patients during their series of psychological therapeutic sessions. Mia is a successful, unmarried malpractice attorney who returns to therapy with Dr. Paul Weston after a 20-year absence because of a lack of stability in her personal life. Davis also starred in an NBC short-lived drama series called Deadline with Oliver Platt in 2001. She played the ex-wife to Platt's character at a newspaper giant. Davis also starred in the short-lived NBC television drama, Allegiance, where she plays Katya O'Connor, an ex-KGB agent. Her son works for the FBI/CIA, and Katya's family is brought back into action by the SVR in hopes that Alex, her son, can be swayed to join the SVR. She later appeared in a reoccurring capacity on Wayward Pines and American Crime. 2013 Law & Order: Special Victims Unit Viola Mesner Episode: "Born Psychopath"
↑ Abele, Robert (Aug 10, 2003). "Less is really more; Actress Hope Davis prefers to make her mark in low-budget enterprises like 'The Secret Lives of Dentists' and 'American Splendor.'". Los Angeles Times. ↑ interview by Tavis Smiley (September 26, 2005). "Hope Davis". PBS. ↑ WEBER, BRUCE (August 20, 1995). "THEATER; The Fine Edge Between a Role And Real Life". New York Times. ↑ Kennedy, Dana. "THE NEW SEASON/FILM: UP AND COMING: Hope Davis; Lucky for Her, She Flunked the 'Nuprin' Audition", The New York Times, September 13, 1998. Accessed December 18, 2013. "Ms. Davis, who grew up in Tenafly, N.J., where she was the second of three daughters, has no explanation for her long, lean period other than to say, 'I just wasn't ready for success.'" ↑ Rohan, Virginia. " North Jersey-bred and talented too", The Record (Bergen County), June 18, 2007. Accessed July 5, 2007. "Hope Davis: Class of 1982, Tenafly High School." ↑ Andreeva, Nellie (8 July 2009). "Hope Davis to play Hillary Clinton". The Hollywood Reporter (Nielsen Business Media). ↑ "Hope Davis Emmy Nominated". Emmys.com. Retrieved 2012-08-17.